Hitler or European Democracies Responsible for the war in Europe? In the video Hitler is seen making speeches to the public of Germany. In his speeches he is seen using very vulgar and emotionally charged words when speaking about attacking other countries and how he plans to take revenge for the attacks they have made. Whatever he says, the Germans are always applauding and cheering for his speeches which tells how he had made the Germans believe that they should fight back and was the right thing to do which thus lead to war between Germany and Europe. 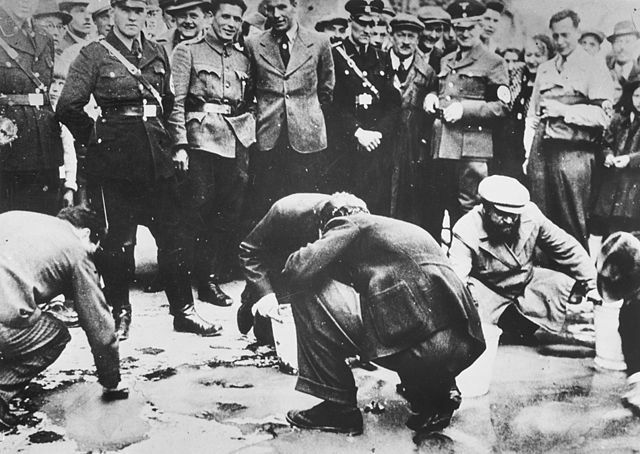 In the picture above it shows Jews on their hands and knees picking up trash from the ground while Nazis watch them from above smiling. This shows that Hilter had brainwashed Germans to belittle Jews and that the Jews are a threat to them so they must not treat them as an equal. Hence because of this mindset the Germans despised the Jews and thus a war occurred because if the tension within the 2 races. 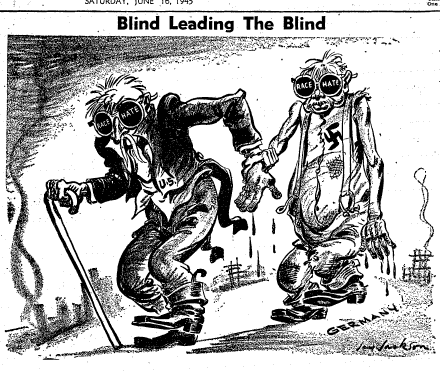 In the political cartoon, Hitler can be seen wearing a pair of sunglasses with the words 'race hate' written on each frame of his glasses. This shows that Hitler was blinded by his racism and is stepping out from the completely destroyed Europe. Hence i can tell from this source that Hitler was the cause of the War in Europe because of his racism and hate towards other races. 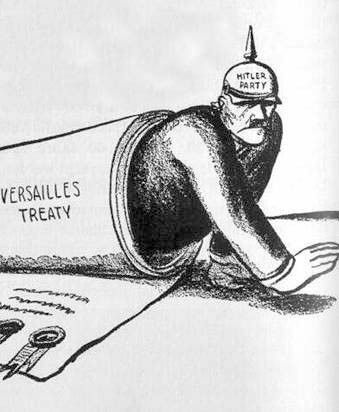 This cartoon shows a person crawling out of a scroll of paper labelled 'versailles treaty' and he is wearing a hat with the words ' Hitler Party ' on it. This shows how the treaty of versailles was not efficient in controlling Hitler from rising in power at all and it was fairly easy for Hitler to forgo the treaty and do whatever he wanted to. Because of this Hitler was able to create his own army in Germany and hence lead his army to war which caused war in Europe.